The product itself is outstanding! I recommend buying in bulk. It will get used. It's easy to forget these minor ingredients in the brew process, but this one works perfectly and exactly as advertised. Not harsh, but a very effective cleaner for all brew equipment. When you're done brewing you're actually not quite done...makes the clean up easier. Typically brew at night so not done until late; just pop a tablespoon or two into the carboy and finish the next day. No scrubbing needed! PBW does all the cleaning work for you. I used to scrub with brushes, but that just caused problems by introducing scratches into the surface of what I was cleaning. Now I just soak dirty parts in a proper solution of this and let it sit (longest necessary was overnight, for really tough dirt). Easy. The 1lb tub doesn't ever seem to last as long as I'd like it to, so I usually prefer to get the 4lb'er. The best cleaner on the face of the planet. Breweries all over the US trust PBW, it is literally the standard for CIP. Great beer starts with pbw! This is stuff is a necessisity for ANY brewer! Can't brew without it. Also amazing to use as a household cleaner. Soak your jewelry in it! in my mind fancy sanitizers are a dime a dozen but this cleaner is required. I recently rehabbed a 10 year old system by using PBW and StarSan, it looks like brand new. It will do wonders on your equipment. Cleans kegs like a charm too. I've used PBW on my plastic carboys ever since a small packet of it came with my first MoreBeer kit. The product works great... even when I "inherited" a dirty glass carboy that hadn't been cleaned in over a year, PBW broke down the soil & got that stuff off. I haven't had problems with scratches in my plastic carboys b/c they never need to be touched by brushes! I will caution that you are well advised to use rubber gloves & wear eye protection when handling this caustic cleaner. Make sure you use it in a warm water solution for best results. This product does the job even on the worst deposits. Use the strength recommended on the label and there will be no issues with its effectiveness. Saves time and effort getting things clean. This cleans pots, tubes, carboys, buckets, etc, amazingly, but it's pricey. If you aren't cleaning aluminum, washing soda (Sodium Carbonate) works just as well for me and is a lot cheaper. 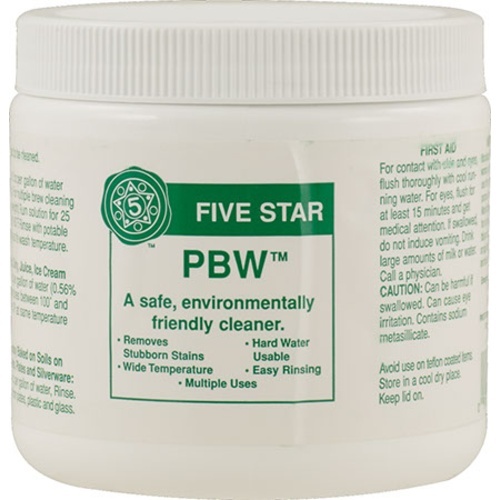 I would recommend using PBW only if you're washing aluminum. I use PBW to clean EVERTHING! Brew kettle, pump, plate chiller, tubing, carboys...anything! Gets everything good as new! Just let it soak. If its not off just give it time. PBW is an amazing product. For a long time I used curved brushes and elbow grease to clean my fermenters. Then I found out hot water + 2 tablespoons of PBW can clean a carboy overnight. For really grimy/hoppy carboys leave the water with PBW for a couple of days. It will melt away all the gunk. I have never had trouble cleaning carboys with PBW. Even when I leave them sitting out to get the funk really dried on there, a 30 minute PBW soak makes the crud wipe right off. This stuff is awesome. Use with my a pump to clean kegs and carboys and everything is squeaky clean. Also works great just letting it sit and sail. Works for lots of stuff around the house. If you don't keep this on hand and your a brewer, your beer is gross. Bottom line. Powerful stuff. I try and follow the instruction, rinsing with the same temp water, to prevent beer stone/mineral build-up. I also follow with a Star-San rinse on every item. I find this also helps minimize the build-up. Plus every item is sanitized for storage. I use this to clean all my homebrew items. it is a must have. If you don't want to worry about cleanliness this is the way to go. i don't know why it's taken me so long to finally use this stuff. this is by far the best cleaner out there!!! Mix it up, and let it soak on the inside of your carboys, and wah-la, in the morning everything comes right out. no need to use a brush or anything!!! i usually reuse the mixed solution for a couple of batches and it seems to keep on working. it does a miracle on bottle labels also! amazing product all around! I've been using PBW since day one and I can't see why I'd want to use anything else. It's formulated to break down the junk brewing leaves behind and it does just that! Great for cleaning carboys and kegs. I always have this stuff on hand. Let it soak overnight and it will take off just about any dried on crud. Great for cleaning march pumps, and silicone hoses! I end every brew day with this. Use this at the brewery and at home. Nothing left to be said. This is a must have in your cleaning arsenal. It's designed specifically for cleaning brewing equipment so you're not going to get any funky odors or taste if you use it properly. A friend gave me a used 5 gal soda keg to use for brewing. He said it's probably pretty nasty inside. Well it was. It had gummy junk in there left over from a Raspberry Wheat Ale. The seals were sticky and there was stuff on the walls of the keg probably because it was opened, dried out some but it was never cleaned. So I put two Tbs of PBW in along with some warm/hot water and let it soak overnight. Opened it up the next day - and it was nasty...as in a lot of the junk had floated to the top. So I dumped it out and then rinsed it off and dang that stainless steel looked like it just came off the assembly line. I did add another Tbs and let soak for another day just to be sure but there wasn't anything the next day that came off. So this is some good stuff if it can clean with one dose. Highly recommended for cleaning things like your kettle, kegs, and even your plate chiller if you have one....just make sure you rinse well or there is a residual white coating that left behind. Removes any beer-related crud from your brew kettles, fermenters, etc. I now buy the larger size. I use this to clean my kegs. There may be cheaper alternatives, but this gets the job done. Realyl takes the gunk out of the bottles, carboys, kettles, and more. Makes clean up quick and easy. Cleans great what else is there to say! I have only brewed a few times, but every time I empty my glass carboy it is filthy and a pain to get to with the carboy brush. Instead, fill it with 6 gallons of water and a few table spoons of this and within hours all the trub and left over yeast dislodges. No need to follow the PBW/water amount labeled on the container. Going half the amount works just fine with me. Great Stuff if you need to clean your items like carboys, bottles and buckets. This is Not a sanitizer! I would suggest Star San for that. Works extremely well - we also use it in the kitchen for cleaning. Makes SS sinks shine! This is by far the best cleaner available. Makes cleaning brew kettles a snap. Really grimy parts you can soak in solution. Versatile and great! What do they say; work smarter not harder? Hot water and PBW do all the cleaning work that usually requires scrubbing. Soaking kegs and carboys gets all of those stuck-on solids dislodged and ready to be rinsed and sanitized. Great stuff! I use PBW, Star San and hot water. Works great on all of my boilermakers and 27 gallon conical. It works wonders on label removal from anything. Buy it in the largest quantity you can, you will use it all the time. You can even use it in the dishwasher. Great for getting rid of gunk of all sorts. My first line of cleaning will always be hot water, or hot water and dish soap. However, when that fails PBW usually handles what's left. To echo other reviewers' comments: (1) This is a cleaner, not a sanitizer. Get some Star San too! (2) The product will coagulate if you mix it with excessively hot water. My experience with this product is more good than bad. I haven't had any contamination issues with any of beers so it seems to be doing the job. But I have been unimpressed in certain instances (such as trying to remove scorched extract from the bottom of the brew kettle, or other cooking stains) where it didn't seem to have much of an effect. I had to use a scotch bright scrubber pads instead at times. Not sure how powerful PBW is supposed to be. As far as my beers go, I clean everything pretty spotless after using it (with just dish soap and elbow grease), so when I go to use them the next time there just might not be much for the PBW to remove, thus why it seems to have worked and my beers have been contamination free. But as brewers we HAVE to use a cleanser, so I'd get it. Just make an effort to generally clean everything really well after each use. Oh, and get the bigger container, since a cleanser is a must you might as well get the most economical size. I went through the 1 lb one really really quick. I clean my kegs and remove labels from bottles with this cleaner. Sparkling fresh every time. Note: this is a cleaner, not a sanitizer. This stuff is perfect for plastic carboys. Add the correct amount into a carboy with all that post-ferment dried on beer goop, filled with water about 110 degrees, and carefully stir to dissolve a bit (so you don't scratch the inside of the carboy), and leave it overnight. Next day - spotless. no scrubbing. Amazing. Works on glass ones as well, of course. Thank you PBW. 2-Stars due to the price point of this cleaner. It's doesn't work that well with stainless steel equipment. It does work decently with plastic equipment, such as a plastic fermenter. Be careful not to heat PBW beyond 180F or it will coagulate on you and become extremely difficult to remove, even from stainless steel. This one of the most amazing purchases of life ! Thanks for turning dreams into reality morebeer! Dirty brew house be gone! What hot water, and possibly dish soap, can't get, this will! I use it on all my equipment right after brewing and it really does clean everything 100%. Gotta have it. And please don't confuse it for sanitizer. You still need to sanitize after cleaning.